A note on caricature: Part IITo my dad: thank you for working so hard to make the world a safer and more beautiful place for me to live in. Proof that mixed-race families eating Cheerios is not a new phenomenon. When people complain about political correctness and suggest that anyone on the receiving end of derogatory comments “get over it,” I think about the little mixed-race girl in the recent, much-discussed Cheerios commercial. That a child—and what she represents—could generate the kind of hate-filled backlash that forced General Mills to disable the comments section for the commercial on YouTube, and simultaneously inspire a chain of racist rants simply by existing, defies comprehension. (True to his nature, my dad immediately went out and bought a box of Cheerios after seeing the ad.) Do we really expect a child, much less an adult, to shrug that off? The question of how/why we find ourselves talking about the controversy surrounding a mixed-race family eating cereal in 2013 becomes rhetorical; there is, of course, no rational explanation. 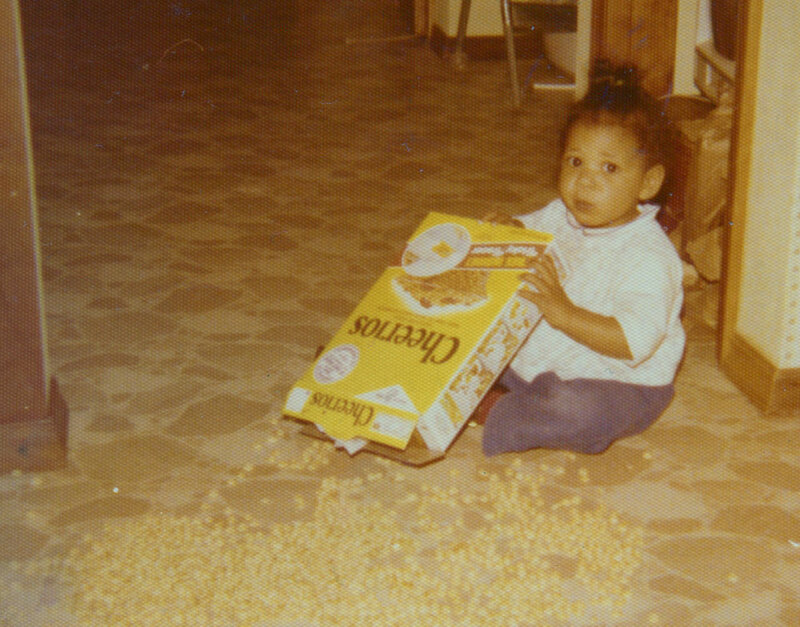 After all, mixed-race children have been eating Cheerios long before the “Love” spot came into existence. And yet, in my mind, this situation is one of the clearest testaments to the pervasive nature of caricature. As I have mentioned in previous posts, negative caricatures play a significant role in shaping our opinions about people—based on gender, skin color, hair color, etc.—whether or not we consciously realize it. And given that these negative caricatures are wrapped up in advertising and sold to us as part of our regular media/marketing diet, it’s no small wonder that just the concept of a mixed-race family, you know, being normal, could cause such pandemonium across the Internet. In other words, when people of color have been portrayed as lacking in humanity with a tendency toward greater animalistic behavior and lesser intelligence, the idea of us being an integrated part of society at large and on equal footing with everyone else appears, at least to some, as unnatural. The sad part of all of this is that the word “race” is only a social construct; "race" means nothing when it comes to intellectual aptitude, creative ability, etc., yet we use the word to justify some of our attitudes about a given group of people. In addition, we have strong visual language in the form of team mascots and other caricatures to reinforce what we believe. Savage, barbaric, degenerate, lascivious. These are all words that have been used to both describe and portray people of color for hundreds of years. My father, Lee Roy Berry Jr. When we aren’t used to seeing multicultural families, we perceive them as strange; when we have little opportunity to interact with people from other ethnic, religious and cultural backgrounds—and when we don’t bother to read up on our own country’s history—we hamper our ability to acknowledge the significance of the rites and rituals of others’ cultural understanding. We seem to think that this is a sign of weakness rather than strength. And then we complain about political correctness inhibiting our ability to say what's really on our minds. I grew up with a black father. His generosity, wisdom, genuine care and concern for those who cross his path, his sensitivity and strength, and his intelligence, creativity and humility all fly in the face of the caricatured stereotypes that are reflected back at him. (I find it ironic that a person who has, for me, always represented safety and security, is constantly portrayed by in films, television and advertising as “dangerous.”) People tease me about the extent to which I dote on my dad. However, caring for him is an expression of self-love and self-care; it is my way of accepting the part of me that is also part of him, especially when confronted with images and language that try to tell me that I am not worthy. So, again, whether we are talking about a team mascot or a food company trademark, and whether we think people need to stop being so sensitive or not, the whole discussion comes back to the inherent humanity of each and every person. Caricature has the power to skew our vision in ways that are harmful. If we can grasp that, and remember how hard it is when we feel as though we aren’t being fairly/accurately represented, perhaps it will enable us to understand one another better, and with greater forbearance.